A plush comfort creature could be just what worried kiddos need to open up about their fears—and feel some relief. Kids write down what’s bugging them and zip it in the Worry Eaters’ mouth. It’s a simple but effective task that encourages kids to express themselves. The act of passing problems on to their stuffed sidekick can give children some peace of mind. Also, the practice can help spark a discussion with grown-ups. 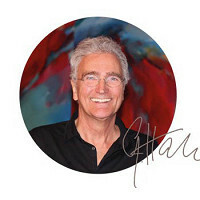 Gerhard Hahn dreamt up Worry Eaters when he was wishing (and hoping) for a monster to come gobble up his adult stresses. He began sketching a friendlier version of his vision as a way for kids to cope with their own fears. On top of the emotional good they can do, Worry Eaters are incredibly soft and cuddly—something most any kid can appreciate. Hi Grommet fans! 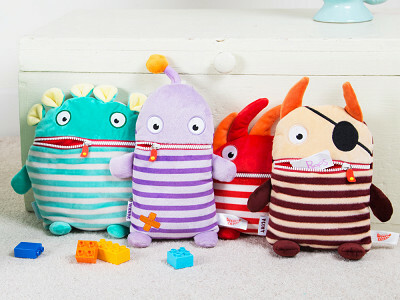 I am so thrilled to introduce Worry Eaters to you. These magical, high-quality plush characters are not only lovable, cuddly toys for kids but quickly become trusted friends that kids can share their worries with. Thinking of a particular family member that could use this and as soon as I decide which one, I'll be ordering. I wish kids didn't have to have worries but unfortunately in today's day and age, it seems like these items grow rampantly. It's always nice to have a friend that will listen and maybe even take away or share at least a part of the worrying! Adorable too! @Lenita Thanks Lenita, I personally have one as do two of my three teenagers. Let's face it everyone has worries and it's much better to acknowledge them than to let them fester. It is sad that the kids these days have a different set of worries than us adults had growing up but teaching them that worries are normal and then teaching them how to process and problem solve those worries helps them grow up into self-sufficient, confident adults. What a cute idea and a nice price too. Ordering one for my granddaughter right now just can't decide which one as they are all so cute!! A princess looking one may be a good option too. @Guest We are glad you like them! I will pass the princess idea on to the designers, thanks! What are they made of? Where were they constructed? Washable/dryable? @Shelly Hi Shelly, the plush is 100% polyester, and yes they can go in the washer on the handwash cycle in a laundry bag but do not put them in the dryer, let them air dry. We have taken these cute little guys and written on them with ink, rubbed them in the dirt and basically roughed them a bit, spot treated the stains with a little bit of laundry detergent, put them through the handwash cycle in the washer and they came out clean and no worse for the wear. 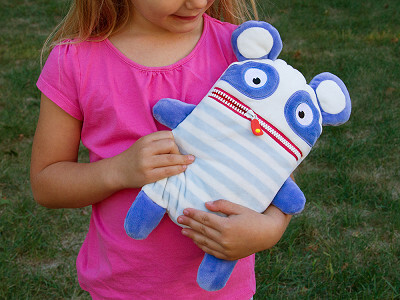 The Worry Eaters are designed/owned by a company out of Germany and are manufactured in China to their specifications. @Tami Sorry, Shelly, I should have mentioned cold water when washing Worry Eaters. @Amy This is where you create your own! I know about not wanting to continue buying all that is - from China. Bet someone in the US comes up with their own version!! It could be you!! Awesome idea though. @Janis @Amy Hi Amy and Janis, thanks for the comments. I appreciate you sticking to your shopping values. I myself feel good about buying things made in U.S., but I know the cost to produce these in the U.S. and that we as a company produce our products in China. We support a family business in China and they hire a lot of awesome people who support their families with those jobs. Because our business thrives selling these products, we have grown and have hired a dozen people over the years, thus providing jobs in our local economy. Also, all of our contractors are in the U.S., such as web designers, printers, graphic designers, I T specialists, etc and all that adds to our economy which we wouldn't be able to do manufacturing in the U.S.
My 7-year-old actually took her Schnulli to school every day last semester. Whenever she felt unhappy or worried, she'd pick it up for a snuggle. Kudos to her teacher for seeing that it helped to have that connection during the school day, and thanks to her worry monster for helping her through some rough days! @Kristiana Thanks Kristiana, we love hearing these stories! We are so happy to hear Schnulli is helping your daughter and agree kudos to her insightful teacher. Worry Eaters have found a great fan base with teachers and guidance counselors - I'd even go so far as to suggest it would be a great holiday present for your favorite teacher. Our Kiwanis Club project this year is gathering stuffed animals for children who are at Akron Children's Hospital. I can't think of a better gift for children who have so much to be worried and frightened about. I don't suppose you might consider a discount if we placed a large order? Regardless, I am ordering one of these for each of my great nieces and nephews for Christmas! Hi Barb, that is a phenomenal gift idea for the children at the hospital and your nieces and nephews. As far as large orders, if you contact our wholesale team at [email protected], they'll follow up if and when they are available. Also, I'd be remiss if I didn't ask, is this comment coming from the upside down? These should not be just for kids, grown-ups could really use them too. @joanne We agree! Everyone has worries and sometimes it's just great to express your worries and get it the weight of those worries "off your shoulders." I'm a behavioral and developmental pediatrician, so see lots of kids and teens with anxiety. These are great! I will definitely pass this information on to families and therapists in the area. Hi! quick question---how deep is the 'gobble pocket', would an iPhone or iPod fit into it? Hi Stevie, only Schnulli and Flamm can eat away your technology worries. We even tried with the new iPhone 7+ with luck. A plush comfort creature could be just what worried kiddos need to open up about their fears—and feel some relief. Kids write down what’s bugging them and zip it in the Worry Eaters’ mouth. It’s a simple but effective task that encourages kids to express themselves. 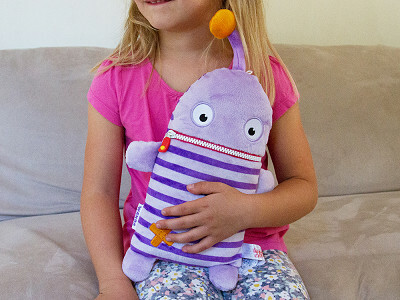 The act of passing problems on to their stuffed sidekick can give children some peace of mind. Also, the practice can help spark a discussion with grown-ups.